BBC NEWS | UK | Northern Ireland | No guts, no government? The Ulster Unionist leader Sir Reg Empey characterised the row over policing between Sinn Fein and the DUP as a "Mexican standoff". When a government official heard this, he was alarmed: "That involves two Mexicans with guns. The guns have been removed!" Perhaps so, but the old patterns of negotiations have not been decommissioned as the ghost of talks past continues to haunt St Andrews. 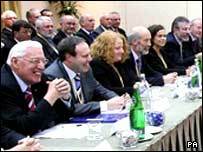 Sinn Fein's Martin McGuinness has told reporters he needs Ian Paisley to help him deliver policing. It used to be David Trimble who had to help republicans, only the issue was guns. And it used to be that republicans had to jump first on IRA decommissioning before there could be powersharing. Now Sinn Fein has to jump first on policing. The signs of failure at St Andrews have come early. The prime minister's official spokesman has already planned for deadlock by telling the media that the governments will draw up proposals if there is no agreement between the parties. Here in St Andrews Bay the tide is turning over the deadline too. It's long been speculated that it is the taoiseach who is more enthusiastic about the 24 November deadline than Mr Blair. One talks delegate said that in his party's meeting the taoiseach was talking tough on the deadline, while the prime minister sat grinning. Perhaps too much is being read into body language, but Mr Blair's official spokesman certainly cleared up the Alliance leader's confusion on whether the deadline was for devolution or just an agreement on devolution (David Ford wasn't the only one confused). Downing Street said it related to an agreement while the Irish foreign minister, no doubt not wanting to contradict London, said the deadline meant: "The immediate kicking in of the ISSUE of devolution." Dermot Ahern also talked about the operation of the bones of a deal, but did make clear he wasn't prepared to wait months for implementation. Nonetheless, this is not exactly what Tony Blair and Bertie Ahern said when they imposed their 24 November deadline. Back in June there was a very specific timetable for devolution. Has the DUP's success in melting the government's resolve on the deadline encouraged it in its demands? One delegate claimed that the DUP wants all ministers to sign up to a pledge of office that not only includes support for law and order but also respect for Northern Ireland's constitutional position and agree to put Northern Ireland first. Martin McGuinness, Sinn Fein's chief negotiator, is unlikely to agree to that, but he claimed a deal could be done in the morning and his party is ready to do it. He claimed the only question is whether the DUP leader is up for a deal. Ian Paisley hasn't said no. But he hasn't said yes. The prime minister's official spokesman has been saying with some sympathy and understanding that Sinn Fein doesn't trust the DUP and the DUP doesn't trust Sinn Fein. 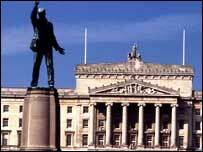 But if both parties really do want power at Stormont they will have to take a risk somewhere along the line. It used to be a case of "no guns no government" but as one cynical hack put it, it's now "no guts, no government." Will we now see progress in NI?